Forested wetlands are understudied environments in decline due to human activity. 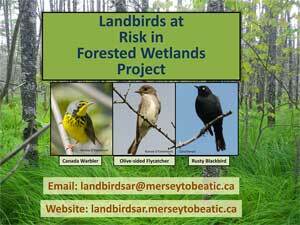 Three birds listed under the Species at Risk Act breed in forested wetlands and are of high conservation concern in Nova Scotia: Canada Warbler (Threatened), Olive-sided Flycatcher (Threatened), and Rusty Blackbird (Special Concern). Conservation of these species requires an understanding of the relative quality of their habitat and the distribution of this habitat in Nova Scotia. Currently, a lack of such information presents a challenge to developing strategies to reverse the declines of these species. The objectives of the Landbirds at Risk in Forested Wetlands Project are to identify areas of high-quality forested wetland habitat for these species in Nova Scotia; to determine what distinguishes higher from lesser quality sites; and to determine where this habitat occurs in Nova Scotia. We are seeking volunteers to conduct short surveys for these birds between late April and early July 2017. Our priority are sites where these birds have been found in the past ­ we want to know what areas still support these birds and thus are important to conserve. Volunteers of all birding skill levels can make meaningful contributions to this project! Information on the location of these birds helps contribute to their conservation.